(10:25 a.m. BST) -- Celebrity Cruises' second Edge-class ship, Celebrity Apex, will be christened in Southampton and sail a mini-season in the UK in 2020. At a September 13 event, the line revealed that the ship will join Celebrity Silhouette, enjoying a successful maiden season out of Southampton this year, marking the first time the line has operated two ships in the UK. The decision is a testament to the strength of the UK cruise sector, Celebrity's president and CEO, Lisa Lutoff-Perlo and UK managing director Jo Rzymowska (pictured above) said ahead of a yard visit in France to see Celebrity Edge. 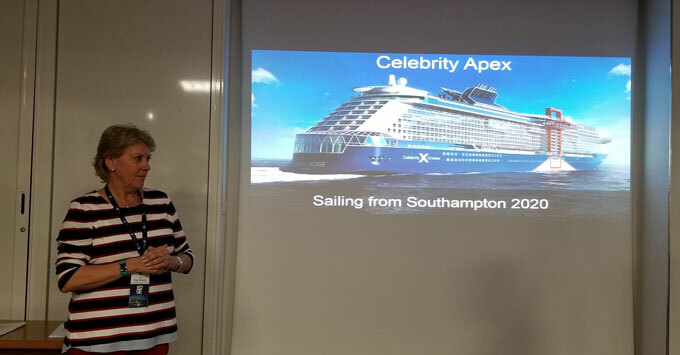 Lutoff-Perlo said: "When Celebrity Apex launches in Southampton in 2020, it will be another incredible moment for our company and for the UK and Ireland market, especially as it will be 10 years since we last named and operated a brand-new ship in the UK." Exact dates have not yet been confirmed, but Apex is slated to launch in spring 2020 -- the second of four planned Edge-class ships. Carrying 2,900 passengers, it will be almost identical to Celebrity Edge, which launches in November this year. Among those first-at-sea features will be a movable deck cantilevered off the side of the ship; cabins with "infinite" balconies designed to blend indoors and outdoors with bi-fold doors; and a Resort Deck, which features a large pool flanked by sculptural trees and two "martini glass" Jacuzzis that overlook the deck below. Apex will go on sale in November 2018.